I really like this tunnel effect, Michael, it lends a dreamy quality and you’re right, there’s an intimacy with the hawk here. Thanks, Jet. I appreciate the confirmation about what I was feeling about the photo. Stunning! I still remember the day when I saw a large hawk perched on our light pole right outside our house. Its wings were spread out and it was just amazing. 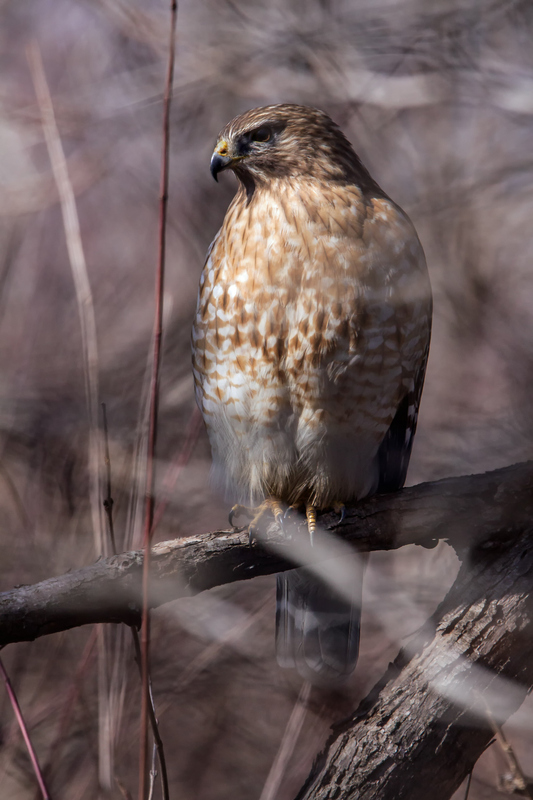 It’s rare that we get a good look at a hawk, but when we do, it’s pretty memorable. Maybe hidden, but not from Mike. I try to keep my eyes really active and somehow I detected an anomaly. I often will try to look through vegetation to see if I can find anything interesting. Gorgeous shot of a beautiful bird. I really like the composition. In addition to what you describe – the idea of looking through the foliage to spy the bird – I like the texture of the soft focus background and the way that complements the texture of the bird’s feathers. Thanks, Laura. The colors also all seem to work well together. It’s a little unconventional, but I like the shot a lot. Nice Mike! Always fun to see and photograph a hawk! Thanks, Reed. It is particularly fun when I have a chance to see one at close to eye level. Usually I am looking upward at a sharp angle.